The staff members were amazing. They recommended local places to eat, shop and entertainment. They placed a fridge in our room at no extra cost and were very helpful with all of our needs. The room itself was spacious. 2 queen beds and a pullout couch. The bathroom was cramped though. Great hotel,food, and people. Not close to any nice dining but the food is great at the hotel. Convenient location on Yonge St., walking distance to St. Lawrence Market, Alllan Gardens and ferry to Toronto Islands. The Village off Church Street and Allen Gardens are within a short walking distance. It's close to a nice park with botanical garden inside (Allan Gardens). This is a great location as it overlooks Allen Gardens and park. Allan Gardens is located in a vibrant area of Toronto known for its popular theater scene and top museums. The neighborhood is home to 702 hotels and other accommodations, so you can find something that works for your stay. 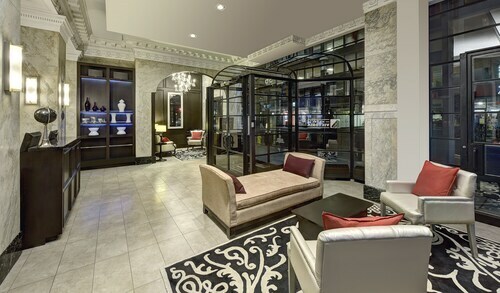 The Grand Hotel & Suites Toronto: With a stay at this 4-star hotel, guests can enjoy access to a full-service spa and a restaurant, along with an in-room kitchenette. 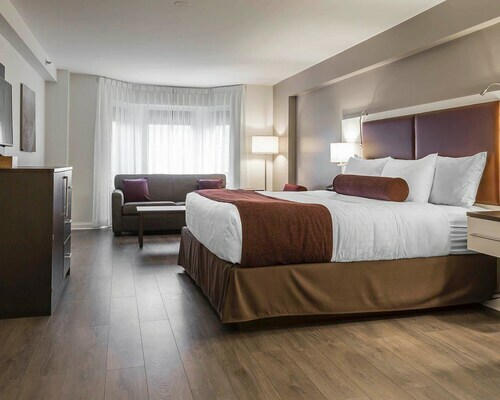 Our customers like its family-friendly amenities and clean, comfortable rooms. While you're in town visiting Allan Gardens, you can discover everything there is to see and do within a couple miles of the area. Study the collections at Hockey Hall of Fame, Royal Ontario Museum, or Casa Loma. Sights like Nathan Phillips Square, The Distillery Historic District, and Harbourfront Centre are landmarks to visit in the area. You can catch a show at Ed Mirvish Theatre, Elgin and Winter Garden Theatres, and Sony Centre for the Performing Arts. Ryerson University and Yonge-Dundas Square are some sights worth a visit in the area. Toronto Eaton Centre is also located 0.6 mi (1 km) from Allan Gardens, and St. Lawrence Market is 1 mi (1.5 km) away. With so many choices for transportation, exploring the area around Allan Gardens is simple. You can walk to nearby metro stations including Osgoode Station, St Patrick Station, and St Andrew Station. To venture out into the surrounding area, hop aboard a train at Toronto Union Station or Toronto Exhibition Station.